In the 1990s, pracitioners of orthodox scientific medicine engaged in dialogs with much earnest and passion about the unification of religion and medicine. It was shown in more than 100 studies that complaints and illnesses like diabetes, liver disorders, heart conditions, cancer, arthritis, chronic pains and others are soothed more easily if the patient is spiritually active. It is recognized by now that religious people generally enjoy more quality of life, live more healthily and longer and tend less to depression and suicide – provided that it is a religion which emphasizes positive human values like love, justice, welfare, freedom, etc. The reason for the physical effect of religion and spirituality is not cleared in detail yet since it has to be looked for in the complex relationship of body and mind. Generally, it is acknowledged that religions regulate the feelings of the people and therefore have an effect on the immune system and the psyche. This article is a contribution to this development. 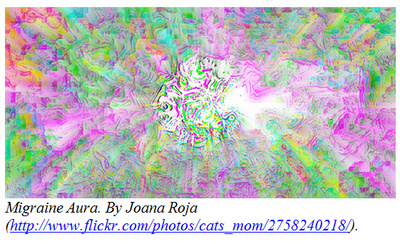 It intends to examine the phenomenon of the migraine aura from the spiritual view and therefore to understand migraine as a physical and spiritual condition which corresponds to lived spirituality and, from there, is accessible and changeable. Migraine headaches are unilateral and pulsating headaches frequently accompanied by an increased sensitiveness towards light and noise, by nausea and dizziness, partly even by cramps and appearances of numbness and paralysis. The duration of this condition may reach from some hours up to some days. The exact causes of migraine are still unclear; there are different neurophysiological theories which put the main emphasis on changes in the blood circulation of the brain or on the neural excitement of the nerve cells. Genetic factors have an influence, too. It is known that a great number of factors can trigger migraine, from stimulants like chocolate, coffee, red wine and salt food, to hormonal changes in the body and emotional strains all the way to climatic conditions. 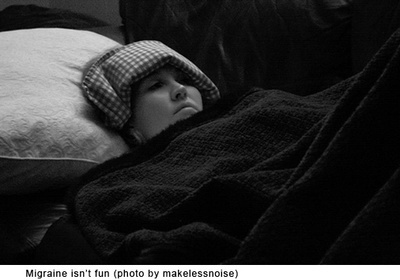 Dozens of millions of people are affected by migraine in the industrial nations of Western Europe and the USA (approx. 12-14% of the women and 8% of the men) where the illness causes several billion dollars in costs every year. This spread has made migraine a component of our culture long ago. Authors like Stephen King and Steven Sills let their protagonists suffer from migraine to point to events lying ahead, or to start a process of reflection. Wassily Kandinsky, Yayoi Kusama, Lewis Carroll, Giorgio de Chirico, Sarah Raphael and other visual artists have let themselves be inspired to works of art by migraine experiences. The wide spread of migraine also finds its expression in the number of treatments beyond scientific medicine. Some of these approaches are rooted in medieval or pre-Christian European medicine systems, others go back to non-Western medicine. Some very old magical and alchemical practices and recipes can be named as an external treatment of migraine. Other therapies understand "illness as a way" (according to Dethlefsen/Dahlke) and try to find the spiritual causes of migraine. A different approach again are systems aimed primarily at the spiritual development of man. In such approaches often inspired by Eastern religions, the cure of diseases is "only" a welcome side effect. Approaches like the latter are isolated from their cultural and religious roots by the Western complementary and alternative medicine and directed against migraine. Such typical therapies of which successes in migraine treatment have been reported are e.g. acupuncture and acupressure, homoeopathy, meditation, Neuro-Linguistic Programming (NLP), sensory deprivation, shiatsu, yoga, autogenic training as well as prayers and spirituality in general. Meanwhile, some orthodox practitioners have changed their minds, too, and have started to use alternative spiritual methods as an accompanying measure against migraine, like including spiritual questions into the treatment of patients or even mentioning spiritual aspects of migraine. 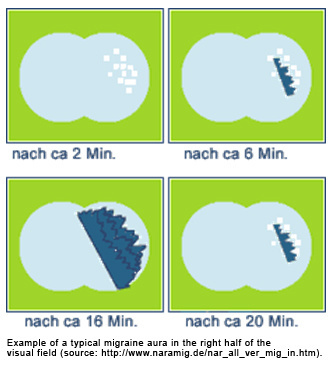 In these alternative approaches, the focus practically never lies on the migraine aura that announces the migraine in a minority of persons affected (10-20 %). In ancient medicine the Greek term aúra d escribed the pre-symptom of an epileptic seizure. In the case of migraine, it serves to describe subjective "imaginary" sensory perceptions which precede the headaches for one hour at most. Although auras can affect all senses, they usually refer to the visual sense. A visual aura consists of several different appearances, typically the flicker (so-called scintillations) and the visual field defect (scotoma). Both can extend and move in the visual field. The atypical visual phenomena like small bright dots, white, colored or dark spots, zigzags, lines, flashes of light, “foggy vision” and others, are more frequent, however. All these appearances can be understood as "form constants". This concept was coined by the German psychologist Heinrich Klüver in the 1920s who carried out tests with the hallucinogenic alkaloid mescaline. In the reports of the test subjects, Klüver recognized always the same geometric patterns. Besides the form constants, other visual phenomena may appear in phases of the migraine aura that we sometimes know from the weekday: included are the complementary colored afterimages, the tiny luminous spheres moving along fast in wound tracks known as Blue field entoptic phenomenon, and the transparent dots and strings called eye floaters or mouches volantes (muscae volitantes). 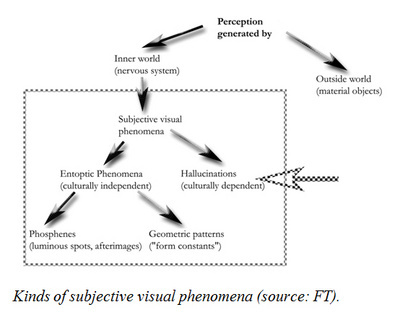 These appearances are designated as 'entoptic phenomena', a medical term for a specific group of subjective visual phenomena. The interpretation of migraine represented here takes the entoptic phenomena as starting point. In cultures practicing a ritual form of deep consciousness alteration, these phenomena are highly valued in religion, art and society. Apart from ecstasy techniques practiced by shamans and seers, migraine can be a trigger for entoptic perceptions. As early as the 1980s, the doctors J. Dexter and A. Friedman stated similarities in the altered central nervous system of migraine patients and of shamans in states of trance. And the ethnopharmacologist Christian Rätsch, in his "Encyclopedia of Psychoactive Plants", draws attention to the perception changes in migraine and in ritual trance states induced by active agents of plants, both triggered by the activation of certain neurotransmitters. All of this allows the conclusion that migraine sufferers experience a stimulation of the nervous system in the phase of the aura which I call an "intensity increase" or "heightened energy metabolism". According to reports, this energy surge frequently manifests before the appearance of the aura and causes good mood, effusive joy and openness, or intensive sadness, fear and depression in people affected. Bodily sensations like prickling, tingling and shivering, which are frequently experienced by migraine patients during the aura phase, are a further sign of increased energy. Such feelings normally appear at moments of intense emotions and are a sign for the openness towards the divine in some religious traditions. This temporary increase in energy as well as the openness has insofar a spiritual meaning as it changes the consciousness and the perception of people. This was looked for by ecstaticists, mystics, shamans and visionaries of all times and cultures to facilitate the contact with the divine. While shamans and ecstaticists, however, are preparing themselves physically and spiritually for such intensity increases and perception changes over many years, migraine sufferers are thrown "into the cold water". Some are able to process this increase in energy, as seen in the fact that in these cases there is no headache following the visual auras. Most migraine sufferers, however, lack the physical and spiritual prerequisites to handle that situation: the increased energy can’t flow freely and evenly in the body – which expresses itself as the typical migraine symptoms of headaches, nausea, oversensitivity but also the unilaterality of the sensations. From the point of view of the ecstaticists, those people who experience such uninvited and uncontrolled intensity increases are more sensitive for altered consciousness states and correspondingly have an easier access to their true self. Thus, for those willing to work ecstatically, this increased energy is a chance not only to get rid of the pain but to develop their own consciousness as well. We can find the inspirations for this ecstatic-energetic work in religions and spiritual teachings which deal with entoptic phenomena. According to my previous enquiries, aspects of an "entoptic spirituality" can be found in practices and beliefs of shamanistic societies, in the mystical and visionary traditions of Hinduism, Buddhism, Christianity and Islam, as well as in modern teachings like the esoteric aura, the theory of Orgone by Wilhelm Reich, or the mystic teaching of the seer Nestor living in the Swiss Emmental. In all these cases, entoptic phenomena are being placed in personal and spiritual contexts and thus made meaningful, therefore being able to provide impulses for dealing with migraine auras. - concentration, meditation and relaxation exercises. It is not a coincidence that many of these exercises and practices were reported to have good results when used against migraine in the context of the complementary and alternative medicine. "And if I let it, and take time, and watch it, it slows down, and I can enjoy the simple beauty of it for what it is." Dahlke, Rüdiger; Dethlefsen, Thorwald; Lemesurier, Peter. (1997). The Healing Power of Illness. The Meaning of Symptoms and How to Interpret Them. (German title: Krankheit als Weg, 1990). Element Books Ltd.
Eggetsberger, Gerhard H. (1992). Hypnose. Die unheimliche Realität. Selbsthypnose, Fremdhypnose, Hypnose im Alltag, Wien et al. Interesting article indeed. For a publication wholly dedicated to the exploration of religion and science and philosophy (The Global Spiral) open to the above link. Interesting on so many levels. I suppose you are using a pseudonym so that migraneurs do not chase you down with pitchforks and torches. Obviously you do not have migraines to have such detached observations of the aura state. The excruciating agony of the ensuing migraine cannot be mitigated by eating well, exercise, meditation, or happy thoughts. We have tried it. When the aura state occurs, we know it will be followed by agony and we know we must act to treat the ensuing migraine or suffer terribly. You approach migraineurs as if we were laboratory rats. I wish I could have read this a few years ago. I had a beautiful visual aura in my upper central vision as I was driving home from work. It was a transparent oscillating orb of bright rainbow colours. It seemed fluid like a ball of gel. I'd never seen anything like it. I couldn't look at it for long because I was driving but wherever I looked it remained in the same part of my vision and that's how I knew it was internal. Then I became afraid and it started to shrink. I didn't get the headache till the next day when I'd been worrying about it quite a lot. I went to my doctor and he told me what it was. I've not had the pleasure of seeing another one. It was so beautiful. But I have developed the technique of meditative self hypnosis which resolves headaches completely if I can lie down. I only take drugs if I have to keep working for 'the man'. Scared people have such violent reactions to spiritual solutions and ironically those are the most efficacious kinds with beneficial rather than harmful side effects! I found this article in the midst of an aura I chose to deliberately experience. I am thankful for a new perception of perceived imminent pain!